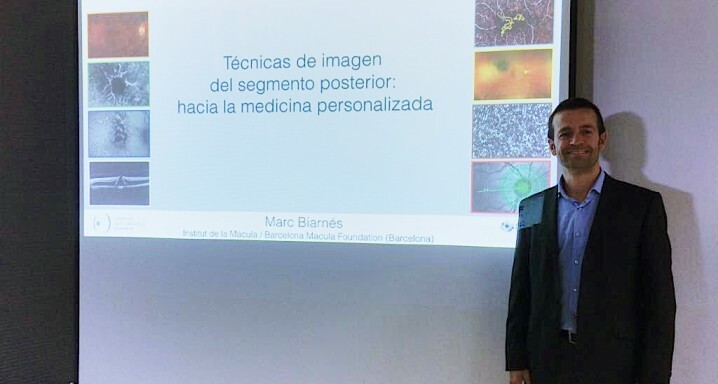 Dr. Marc Biarnés, the Coordinator of clinical trials at the Institut de la Màcula, last Friday conducted a clinical course entitled "Imaging techniques in the posterior segment: towards personalised medicine" at the 2017 edition of OptoInnova. The forum, organised by the University of Alicante, addresses the latest innovations and developments in fields like visual therapy, myopia control, orthokeratology, contact lenses, intraocular lens and refractive surgery. The clinical courses, of 90 minutes’ duration, are broadcast by videostreaming and are available to enrolees for a month. OptoInnova is a congress created as a result of the agreement between the University of Alicante and the College of Opticians and Optometrists of the Valencia Region.